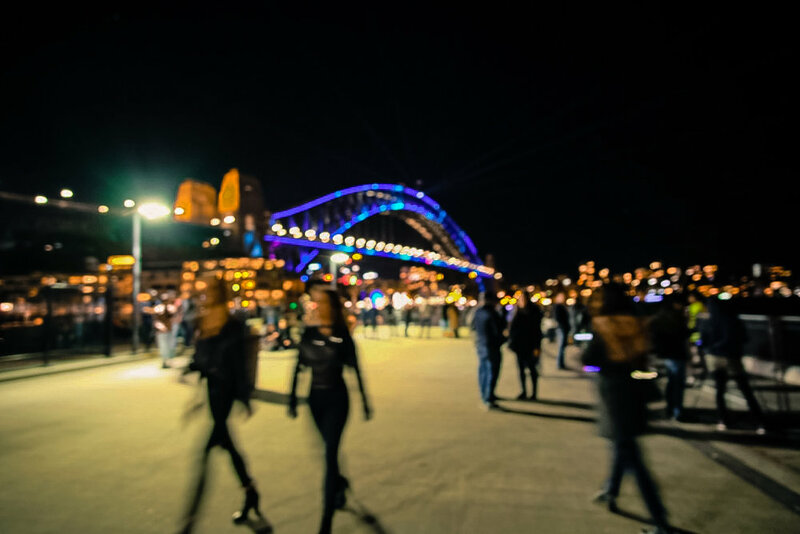 every year the city of Sydney puts on a magical nighttime festival called Vivid. its the city’s homage to light, colour and music as autumn heralds winters approach. 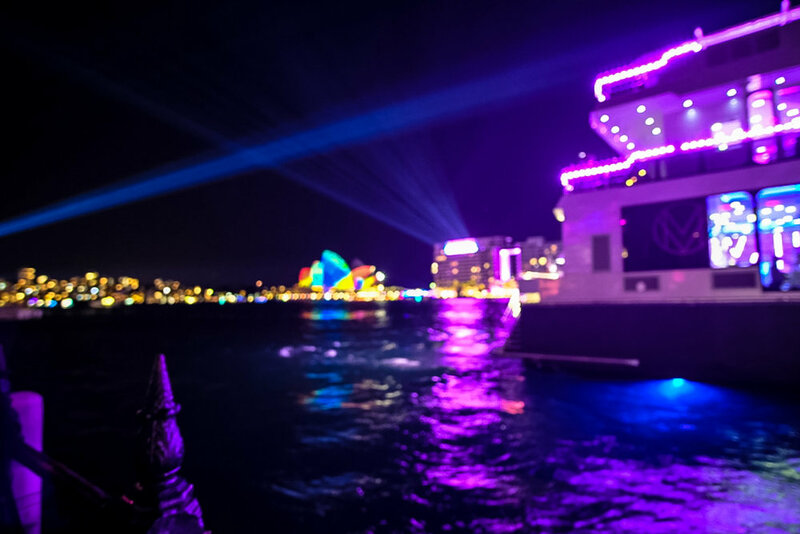 the celebration calls for the city’s key spots and iconic buildings to be lit up in glorious technicolour with laser shows and light installations depicting stories, Australian heritage and art. the heart of Vivid lies at Circular Quay, that famous bay which connects the Harbour Bridge at one end and the Opera House at the other, both of which are on display in their finest plumage during the festival. the roadblocks around the area mean that every train that pauses at the Circular Quay station, spills hundreds of people to join the thousands already there. i’d never been to a festival before and Vivid was my first. it was absolutely spectacular of course, nothing the Australians do, isn’t. about an hour in, i found myself in possession of a circlet of flowers with pretty little lights that wrapped around my head ala 1960’s and looked beautiful against my dark hair. with that little gesture, i felt so festival-y. the lights lit up everything as far as the eye could see, yet they didn’t jar with each other, rather, twinkled against the backdrop of an inky night and created a warm and inviting atmosphere. the music from the show over at the Opera House mingled with the hubbub of people and against the purring waves melded into a soothing hum which made me feel alive and happy. thousands of people were taking millions of photographs to be posted on social media to allow the even more millions from afar, to share in the festivities. there was so much to see and do and feel and experience. and of course, there were so many food stalls that i gave up trying to figure out what i should eat and nibbled my way through everything that held my fancy. i was having a rocking time. i clicked away on the little Fuji trying to capture my impressions, but it was dark and my hands shook with the cold. later that night snuggled in my warm bed with the flowers still in my hair i was disappointed in my blurry pictures, chastised myself for not being a better photographer, endeavoured to learn about ‘shooting at night at a festival’, dismissed my photographs as a useless waste of time and went to sleep. Oof. how hard i was on my poor self. some months later, i accidentally chanced upon the pictures from that night and something about them made me pause. time and distance made me look at them questioningly. they looked like paintings - like the boatman photograph - but more andy warhol like, with, dare i say it, vivid colours. as i stared at my screen, heart thumping in excitement i realised my mistake that june night when i had berated myself- i had been looking for perfect photographs, not i-photographs. the pictures, with their lack of definition and intense colours captured the emotion, energy and feeling of Vivid. no, i corrected myself, not the feeling of Vivid, but what Vivid made me feel - blurry, festival-y happiness.